Cilia, tiny hair-like structures that propel mucus out of airways, have to agree on the direction of the fluid flow to get things moving. Researchers at the Salk Institute for Biological Studies discovered a novel two-step mechanism that ensures that all cilia beat in unison. "The posterior bias allows ciliated cells to produce a directional fluid flow, which then acts in a positive feedback loop," says Christopher R. Kintner, Ph.D., a professor in the Molecular Neurobiology Laboratory, who led the study. "As cilia produce this flow, they sense – although we don't know yet how – the direction of the flow, and then re-orient themselves to optimize it." Their findings also explain the frequently observed misalignment of cilia in primary ciliary dyskinesia (PCD), a disease that impairs ciliary flow. PCD results in recurring respiratory infections, middle ear infections, male infertility and in rare cases hydrocephaly. Each mature ciliated cell has up to 200 cilia, which have to co-ordinate their movements to orient their effective stroke in the same direction as their cellmates and all the cilia on neighboring cells. Cilia movement is driven by an array of longitudinal microtubules arranged in 9 doublets around a central pair. A basal body anchors these microtubules inside the cell. A so-called basal foot, which invariably points in the direction of the effective stroke, juts out at the base of each cilium. And although a lot is known about the structural details of cilia, the mechanism through which ciliated epithelia coordinate the direction of their strokes remained unknown. But before Kintner and his team could get to the bottom of cilia polarity, they had to enlist the help of electron microscopy expert Richard Jacobs, Ph.D., a research specialist in the lab of Howard Hughes Medical investigator Charles Stevens, a professor in the Molecular Neurobiology Laboratory. In collaboration with the Kintner lab, Jacobs helped develop an assay that allowed postdoctoral researcher and first author Brian Mitchell, Ph.D., to determine the polarity of cilia by scoring the orientation of hundreds of basal feet in Xenopus larvae, whose skin is covered with multi-ciliated cells. Analyzing skin explants taken during early embryonic development, Mitchell discovered that, early on, when ciliated cells begin to differentiate in the skin but have not yet generated a significant fluid flow, all cilia roughly point towards the back end of the frog larvae. Within a few hours the cilia refine their polarity and converge precisely on a common axis. If he removed the skin samples before the front–back axis was established in the larvae, ciliated cells were unable to decide on a common direction. Mutations in the gene DNAI1, which render cilia immotile, account for about 10 percent of all human cases of PCD, while the loss of functional Spag6 and TEKT2A/B, both essential components of cilia, cause a PCD-like disease in mice. "When we shut down these genes in Xenopus larvae, we could mimic the clinical observations in PCD patients," says Mitchell. "The polarity of the cilia is still biased towards the posterior, but without a detectable flow the process of refinement is disrupted and they can't reorient themselves properly," says Kintner and adds that, "this model explains why ciliary disorientation is so commonly associated with ciliary dysfunction in human PCD." For the final and most compelling test, the Salk researchers teamed up with experts in the study of flow on cells from blood vessels. With the help of Julie Li, Ph.D., and professor Shu Chien, Ph.D., both in the Department of Bioengineering and the Whitaker Institute of Biomedical Engineering at the University of California, San Diego, they subjected ciliated cells to an external flow using a flow chamber. Remarkably, these experiments showed that flow causes cilia to get in line and agree on a common direction. 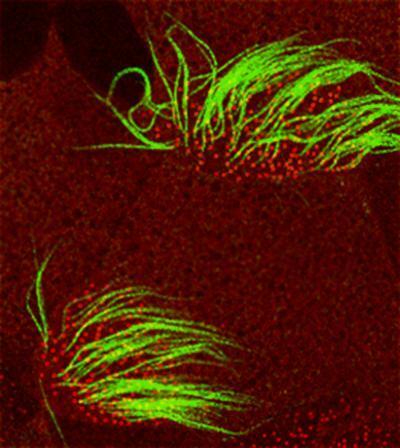 "As long as there is some polarity in the system, cilia can apparently use flow to self-correct over time, making it a very robust system," explains Mitchell.